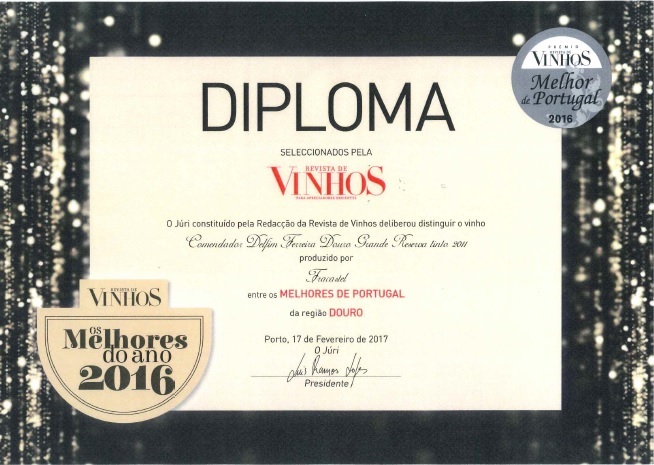 Diploma distinguishing Quinta dos Frades for its visionary project, attributed by SIBAB in 2016. ““Vinha dos Deuses Reserva Tinto 2010” – Silver Medal awarded by Vinhos de Portugal in 2015. "Comendador Delfim Ferreira Douro Grande Reserva Tinto 2011” – Best of Portugal of the Douro Region award of 2016. 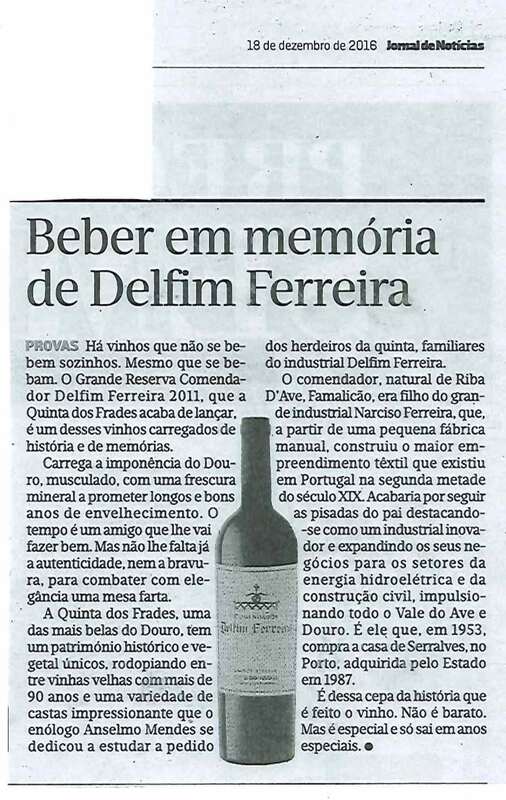 Special review on the Comendador Delfim Ferreira wine 2011 published in the Tasting section of the newspaper Jornal de Notícias of December, 18th 2016. 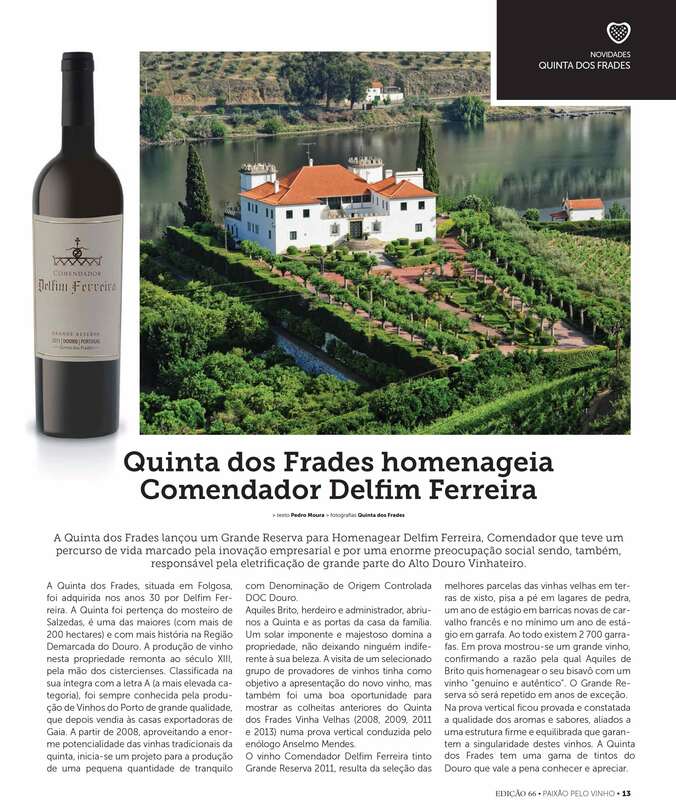 • Feature story on Quinta dos Frades published in the “Fugas” section of the newspaper Público of 2 July 2016. •	Feature story on Quinta dos Frades published in the newspaper Jornal de Negócios of 24 June 2016. 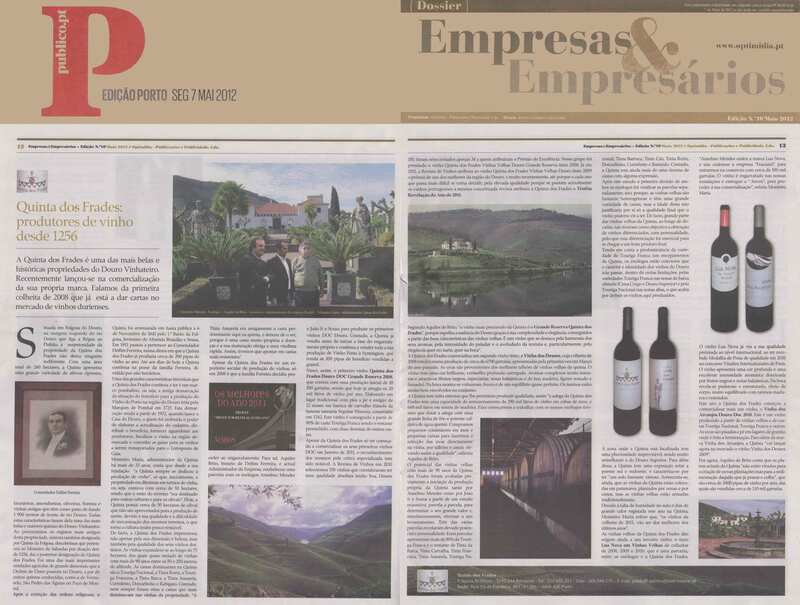 •	Highlight on the Vinha dos Deuses 2008 and Lua Nova red wines in Old Vines 2009 in the newspaper Diário Económico of 15 April 2011. 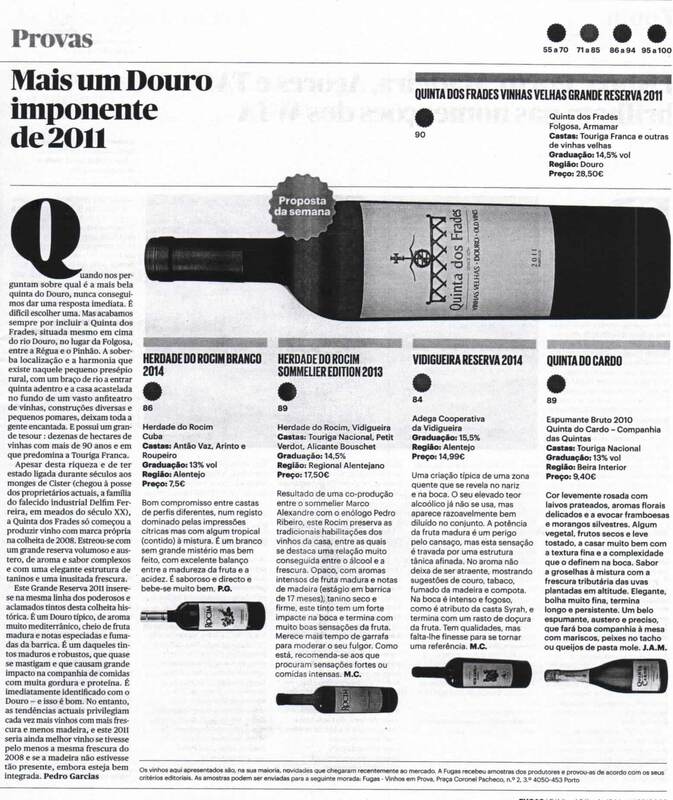 •	Highlight on the Quinta dos Frades wine 2009 which received a classification of 17.6 points in the "Tentações" section of the magazine Sábado of 15-21 December 2011. •	Quinta dos Frades in Red Grand Reserve Old Vines 2011” – Best of the Douro region award of 2013, attributed by the magazine Revista de Vinhos. •	Vinha dos Santos – Red Douro 2011” - Good Purchase Award 2013, attributed by the magazine Revista de Vinhos. •	Lua Nova in Old Vines – Red Douro 2009”, having received the Vins du Monde award of 2011, attributed by Vinalies d’ Argent, Paris. •	Quinta dos Frades – Red Grand Reserve Old Vines 2009”, having received the Best of Portugal of the Douro Region award of 2011, attributed by the magazine Revista de Vinhos. •	Lua Nova in Old Vines – Red Douro 2009” - Good Purchase Award 2011 in terms of quality-price relationship, attributed by the magazine Revista de Vinhos. •	Revelation Producer Award of 2011, attributed by the magazine Revista de Vinhos. •	Quinta dos Frades in Red Grand Reserve Old Vines 2008” – Best of 2010, attributed by the magazine Revista de Vinhos. •	Quinta dos Frades in Red Grand Reserve Old Vines 2009” – Silver Medal awarded by Vinhos de Portugal.